We have recently implemented a system for chores at our house. When Princess Pea was about 3 1/2 we started giving her little jobs that were her responsibility. They were simple and quick - 'tidy up the shoes' and 'hang up your jacket' were the first ones. She loved having 'jobs' that were all her own, and she happily did them each day when she got home from preschool (though she sometimes needed a reminder.) When she was almost 4 we added 'make your bed'. Of course, she often needs help and/or I often have to re-do some things, but it's a start - and an important one, in my opinion. As I mentioned in my post about Toddler Chores for Little Helpers, doing 'grown up jobs' always gives kids such a sense of pride and boost of confidence! I'm using the word 'chores' very loosely here. Obviously, I'm not enforcing Cinderella practices around our home! But Princess Pea is certainly at an age when she can and should have some responsibilities at home. Aside from teaching her a sense of responsibility, having 'jobs' teaches her practical life skills, gross and fine motor skills, problem-solving and pre-mathematical skills, and - perhaps most importantly - reminds her that she is part of a family whose members help each other out. Having responsibilities around the house teaches her that it's important not only to do things for herself, but to do things for the 'greater good' of the family as a whole. We got a bunch of craft sticks and I wrote out a job on each one. Princess Pea illustrated them, since she can't read yet, so she'd also be able to 'read' them by herself. And, since little sister wants to do everything big sister does and is capable of many toddler-sized jobs herself, we marked a green dot on the ends of the ones that Sweet Pea can also do. 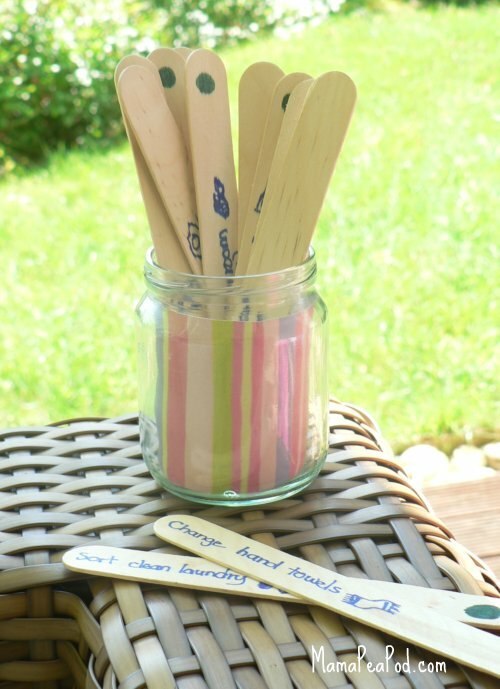 Then we found an old jam jar, decorated it with a piece of scrapbooking paper slipped around the inside, and popped in the sticks. Now, once a day (if I remember) they can each pull a stick out of the jar and they are responsible for doing the job on the stick. Princess Pea can select any of the sticks, while Sweet Pea only selects from the sticks with the green dots. As she gets older, we'll be adding more green dots to jobs as she becomes capable of doing them. 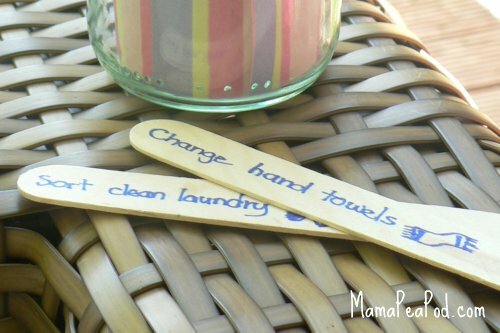 It's a fun way to assign 'chores', and the girls love having 'jobs time'! What other jobs could we had to our sticks?